A new teaching robot is on the job at Sinclair Community College thanks in part to a pair of Sinclair grads who now have good careers in the robotics field. Dustin Engle, 32, a robot programmer, and Jayson Noll, 28, a robotics technician, are on the job at Yaskawa Motoman in Miamisburg. The company is making a new line of educational robots for colleges and universities. The $50,000 robot is stationed in the college’s Workforce Development program to help train manufacturing employees. Sinclair’s purchase of the robot brings things full circle for Engle and Noll. Both are products of robotics education at Sinclair. Jayson Noll built Sinclair’s new robot. Dustin Engle’s work uses software that simulates a robot’s work including welding, painting, dispensing, and specimen processing for the medical industry. Noll, who grew up in Covington, Ohio, graduated from Sinclair in 2015 after majoring in Automation & Control Technology with Robotics. He had attended Wright State University at one point, but left to attend Sinclair. At Sinclair everything was hands-on and there was a lot more student teacher interaction,” Noll said. “And the class sizes were smaller. When you get to know your teacher, it’s easier to ask questions and learn. It all compounds into a better experience. 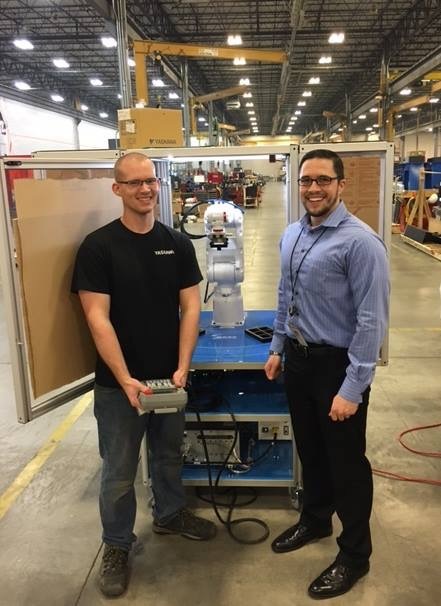 Jayson Noll, Left, and Dustin Engle, Right, stand beside Motoman's educational robot now being used to train workers in Sinclair's Workforce Development program. Two weeks after graduating Noll was hired by Motoman. Noll, who played with toy robots as a youngster, is delighted to be working in a field that’s a good fit for him. “It’s a complicated field and every day you are learning something,” Noll said. Dustin Engle wasn’t exactly sure what he wanted to do after high school. A tour of Sinclair’s robotics lab sold him on the idea of making machines that can make other machines. The first time I laid eyes on the robotics lab I knew I wanted to pursue a career in that field,” Engle said. “I have always been interested in mechanical things and taking things apart and putting them back together. He, like Noll, majored in Automation & Control Technology with Robotics, earning a degree in 2006. Engle, who grew up in West Carrollton, recalls being intrigued every time he drove by the Motoman facility visible along Interstate 75. In 2005 he landed a job there as a computer-aided draftsman. Today he works as a robot programmer. Engle credits Sinclair for his career success. “The small class size, the quality of instruction and supportive structures prepared me for my career at Motoman,” he said. Mike Freed, Manager of Manufacturing Solutions for Workforce Development at Sinclair, said the robot is an important addition to the program. Demand for graduates in the field of automated industrial systems, or robotics, exceeds the supply, said Paul Lawrence, Chair of Electronics Engineering Technology. “For every student, we have five job offers,” Lawrence said. Starting salaries range from $35,000 to $58,000. Fifty students are enrolled in the robotics program at the moment. Sinclair is working to recruit more students. While ten to 15 students graduate annually from the program, it has the capacity to graduate and place in jobs twice that number, Lawrence said.